Make any occasion special with the Marchesa Mandarin Gold 5-piece Place Setting. 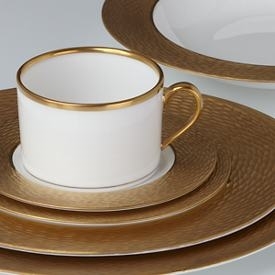 Each piece is lavished in gold with a hammered finish creating a stunning table setting. Diameter of dinner plate: 10 3/4", salad plate: 8", butter plate: 6", saucer: 5 3/4"; capacity of cup: 6 oz.